DOT is presenting the next phase of Queens Boulevard to Queens CB 6 on Wednesday, while CB 2 continues to stonewall protected bike lanes for Skillman and 43rd. It’s a big week for the Queens bike network on the Streetsblog calendar. Later today, Queens Community Board 2 hosts its “workshop” to delay action on protected bike lanes. And on Wednesday, DOT will present the next phase of safety improvements for Queens Boulevard to the Queens Community Board 6 transportation committee [PDF]. Pedestrian injuries dropped 63 percent after earlier phases of the Queens Boulevard project were implemented in 2015 and 2016. Last year, DOT installed the third phase, adding protected bike lanes and pedestrian safety improvements between Eliot Avenue and Yellowstone Boulevard. DOT held a public workshop on the upcoming fourth phase in January, and the Wednesday meeting will provide the first look at what DOT is proposing. To speak up for a street redesign that does a lot for safe walking and biking, you can join volunteers with Transportation Alternatives at 6:15 tonight before heading to the meeting. They’ll be gathering at 43rd Avenue and 39th Street, where a driver struck and killed cyclist Gelacio Reyes last year. More info on the workshop and other events below. Check the calendar for further details. Tonight: Queens CB 2 workshop on Skillman and 43rd avenues. 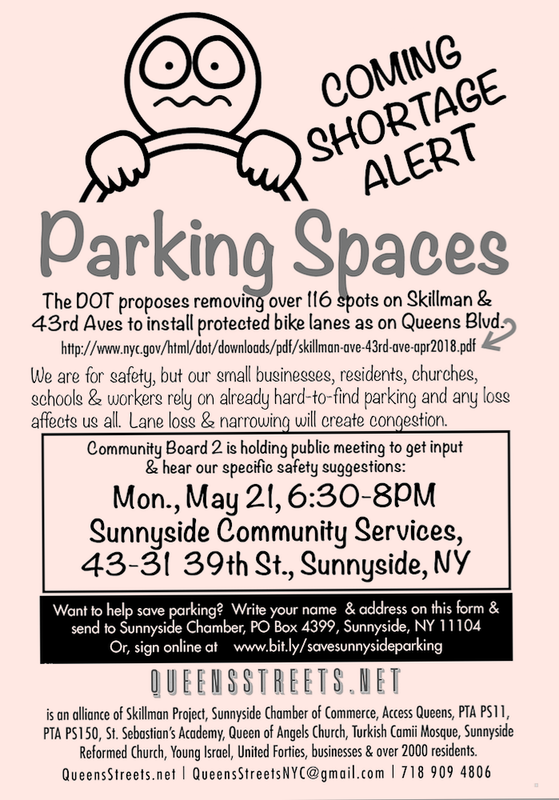 Sunnyside Community Service, 43-31 39th Street, Sunnyside. 6:30 p.m. Meet at 43rd Avenue and 39th Street at 6:15 to join volunteers with Transportation Alternatives beforehand. Wednesday: NYU Rudin hosts a panel on the future of mobility, featuring representatives from Cruise Automation, 100 Resilient Cities, NYC DOT, and Lyft. 295 Lafayette Street, Manhattan. 6 p.m.
Also Wednesday: Reporters on the MTA and NJTransit beat discuss covering transportation politics in the country’s most transit-oriented region. 1 Whitehall Street, 17th Floor, Manhattan. 6 p.m.
More Wednesday: DOT presents safety plans for Queens Boulevard between Yellowstone Boulevard and Union Turnpike to the Queens CB 6 transportation committee. 104-01 Metropolitan Avenue, Queens. 7:30 p.m.
Soooo the DOT is going to downgrade the PBL on Queens Blvd to a standard bike lane? “It’s ok if some people actually die as long as it means it is easy for me to find parking and don’t have to sit in as much traffic. Seriously, it’s ok if we just kill some people if it opens up a parking spot.” – The people who made that sign. It’s hard to see but it’s raised, with a mountable curb. The attachment below illustrates it better. “Any [parking] loss affects us all.” Nope, but safety sure does. I heard this last night. “Everybody needs parking”. So they’re in favor of bike corrals? There was a lot of anger at the session last night. I get the sense that, like Brexit, this is not really even about parking (at least, not primarily about parking). Rather, like Brexit, it’s a sense that things are changing and people feel they are losing privileges that they had in the past and expect to keep. You see this with other neighborhood proposals as well, such as the proposed Phipps building on Barnett Ave., or the proposed schoolhouse on 48th Street. People who have lived in the neighborhood for decades want to keep it (or event revert to) the way it was in the 50s. We shouldn’t accommodate such desires but it might help to acknowledge this tribalism. Frankly, I think this energy is extremely important and should not be ignored or dismissed. Progressive projects like these are likely to continue to be stymied if nothing changes. Since much of the anger here does not actually seem to be about policy, I think much of it can be diffused without making policy concessions. Many people just seemed to feel unheard, or made non-policy remarks about proponents’ “arrogance”. Advocates might be able to take the wind out of this resistance by working on the way these projects are framed or communicated. Just having events like last night, where people can vent, might help. A lot of uninformed opinions. People generally didn’t know the difference between bike lanes and sharrows, and certainly didn’t know about bike corrals. More than one person talked to me about the “bike lane on 39th avenue”, and were adamant when I pointed out there was no bike lane on 39th avenue. Another person pointed out all the other East-West streets in Queens with bike facilities, as if to say that we don’t need this one. Sometimes it’s hard to tell the difference between someone who is misinformed and someone who is intentionally mis-framing things; I think both were in evidence last night. Many of the proponents are loath to acknowledge their ignorance and I think part of the communication challenge is to provide this knowledge without being perceived as arrogant. Can we have another meeting to give those of us who are angry about how car drivers are abusing our streets, and how the city is mismanaging them, a chance to vent? I am tired of the perpetual honking, speeding, and double parking on my street. Honest question: Would you rather have a chance to vent, or get your policy preferences met? The choice is often between these two. What I think is that public officials need to create more opportunities for people to make their feelings heard and also to channel those feelings in a constructive direction. Sunnyside and Woodside are full of good people even if they are angry at times. If we could sit down together on an equal basis and do some planning I think we could eventually arrive at a reasonable and constructive solution. It is going to be very hard and long road to fight the status quo. NYC DOT needs to recognize their streets are constantly clogged by single occupancy vehicles without much benefit to all other modes of transport. NYC’s infrastructure needs to change so people’s habits can change. The de Blasio administration’s Queens Boulevard redesign is a major success, with serious crashes down and cyclist counts up on the four miles of the street that have a bike lane. This year, DOT plans to extend the redesign east from Rego Park, adding bike lanes between Yellowstone Boulevard and Union Turnpike. Three big street redesign projects are on the calendar. Queens Community Board 6 will take up the Rego Park phase of DOT's Queens Boulevard redesign; Manhattan CB 9 will get a look at a revised plan for bike lanes and road diet on Amsterdam Avenue north of 110th Street; and DOT goes to Sunset Park for the second workshop about the redesign of Fourth Avenue. The first week of Bike Month is incredibly busy on the Streetsblog calendar, with public meetings about several major street safety projects, plus Transportation Alternatives' national Vision Zero Cities conference. In the year after NYC DOT installed protected bike lanes and other safety measures between Roosevelt Avenue and 73rd Street in Woodside, pedestrian and cyclist injuries declined more than 40 percent, while bike counts doubled.